I'm much better at writing these reading update posts bimonthly rather than monthly! 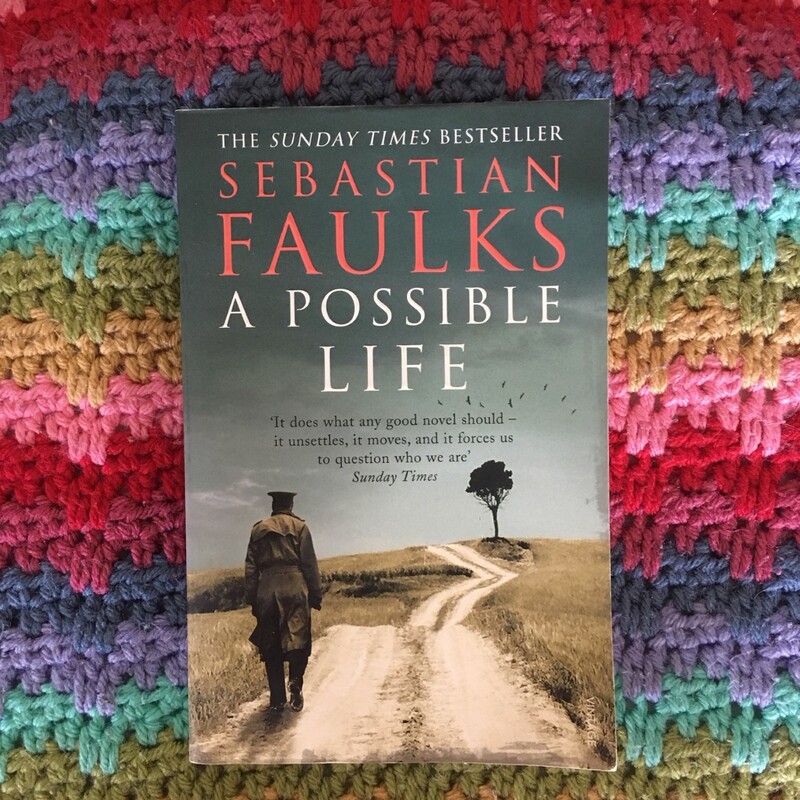 A Possible Life by Sebastian Faulks is possibly my favourite book from the last couple of months. It's in five parts, unequal in length, focusing on different characters (a Victorian family, a soldier during World War One, a scientist a few decades in the future) and what makes us unique but also gives us a sense of shared identity. I loved it. I downloaded A Girl's Ride in Iceland by Ethel Alec-Tweedie last year before I went to Iceland with Guides and was wanting to read all about the country. I never got round to it, but remembered it recently when I wanted something quite quick to read. Ethel went to Iceland with some companions in the 19th century as everyone else was going elsewhere in Europe and this group wanted a bit more excitement. They got the boat from Scotland (I felt seasick just reading about it! ), which took them round the southern coast of Iceland, dropping them off at various places for them to explore inland. The conditions sounded quite basic (as Iceland wasn't exactly expecting lady travellers) but Ethel and her female companion were pretty adventurous. Actually quite inspiring stuff (and made me grateful for my easy BA flight!). Through work, I've been participating in a mentoring scheme and have been having monthly sessions with a lady who is helping me help myself with my career and personal development (there's probably a whole blog post in this). She recommended The Alchemist by Paul Coelho to me, but wouldn't tell me much about it: this is a good thing as it's very much a book which turns out to be quite personal to the reader. In essence, a shepherd goes on a journey, but it is so much more than that. I'd heard of this book before, and I remember a few people reading it when I was in sixth form, but I'm glad I didn't read this at the time, as I think now was right for me. It's a novella, so pretty short, but does have some excellent messages you should read yourself. I've been making an effort recently to read some of the books I've received via NetGalley, and Before I Let Go by Marieke Nijkamp* was one of them. It started off quite well with a plot I was beginning to care about (teenager returns to her hometown in Alaska where her friend has recently died) but then all got a bit weird and I skipped the rest. I find that with YA - I either love the books, or they just annoy me. Sadly this was the latter. Cut: One woman's fight again FGM in Britain today by Hibo Wardere was an impulse purchase, it was either a Kindle daily deal, or a 99p purchase. The author was a victim of FGM when she was six and still living in Somalia. She later moved to the UK and as she grew up she learned more about FGM and the child abuse that it is, before going on to be a campaigner and activist. She is incredibly honest about what happened to her and in places the book is truly heartbreaking. An important, and eye-opening, read. I work in a University faculty which covers all aspects of medicine and health sciences, including the nursing degrees. As such, many of my colleagues teach on the nursing modules and I've learned quite a bit about nursing from hearing their varied experiences. Christie Watson has spent many years as a nurse and has many stories to tell - many of them uplifting, but many of them with unhappy endings. The Language of Kindness: A nurse's story by Christie Watson* is definitely a bit of an eye-opener. I'd heard of Oh My God, What a Complete Aisling: Just a small-town girl living in a notions world by Emer McLysaght and Sarah Breen* before - I think the authors were on Woman's Hour a while ago (I could very well be wrong about this). Google tells me it's 'the Irish Bridget Jones' and covers a year or so in the life of Aisling, a 20-something woman from rural (ish?) Ireland, working in Dublin, and facing boyfriend issues and friendship dramas. It sounds quite cliched when I say it like that, but I enjoyed reading this, and normally it's not my cup of tea. A lot of the cultural references did go over my head, as I don't know very much about Ireland, but I got the gist of them and found myself reading it in an Irish accent (I admit to not even trying to pronounce many of the names!). At the end of April I spent a lovely weekend in Oxford with friends, and read The Lost Letters of William Woolf by Helen Cullen* on the train. William works in the Dead Letters Depot, as a detective who tries to reunite post with its recipient - perhaps the address is only partially legible, or there's only a name. A bit of a love story, a bit of a mystery, although not sure I'll remember much about it in a few weeks. Quite a varied couple of months - I'm doing reasonably well at reading different kinds of books and fitting in some non-fiction which for once isn't work related! Joining in with Laura and the Year in Books. *This was sent to me by the publisher via NetGalley. All thoughts and opinions are, of course, my own. The only one of these I've read is The Alchemist and I wasn't a huge fan. It started off good but by the end it felt too preachy for me. I'm glad you enjoyed it more. I definitely think it's one of those books you need to read at the right point in time.